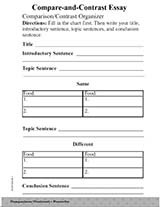 Students are introduced to the creative writing method through this writing process teaching model. This printable set includes a sample how-to chart, a blank how-to chart, and four different revisions of a how-to paragraph. This works well incorporated into your lesson or as a take-home assignment.